Lots of action is packed into this Legend Trap shooter Award. Several elements in the award are raised providing a 3-dimensional look. 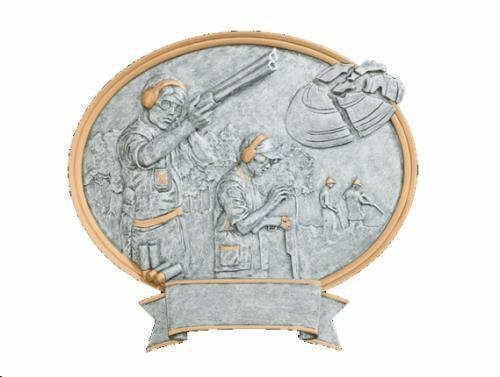 The trap shooter is shown in typical trapshooting attire with his rifle pointed to take the shot while in the foreground a clay pigeon is shown breaking apart by the trap shooters skill completes the scene. . This item can either be hung on a wall or placed on a desk using the included stand.